General Data Protection Regulation (GDPR) Compliance: Get There Faster. The European Union’s new General Data Protection Regulation (GDPR) has helped bring data privacy and proper data handling to the attention of enterprise executives around the globe. Fully enforced by 25 May 2018, the GDPR is a massive piece of legislation that requires data privacy to be baked into enterprise data handling—and it applies to any company that handles the personal data of EU residents, even if a company has no physical presence in the EU. With potential fines for non-compliance as high as 4% of your annual worldwide revenue, how is your enterprise preparing for General Data Protection Regulation (GDPR) compliance? Dataguise is the only vendor to provide end-to-end sensitive data audit and protection to help you meet General Data Protection Regulation (GDPR) compliance requirements quickly and maintain compliance as your business grows. Dataguise DgSecure empowers you with the ability to detect, protect, audit, and monitor sensitive data in near real time across your enterprise data repositories, both on premises and in the cloud—all from a single platform. If you don’t know where all your sensitive data is, you can’t pass an audit. Dataguise DgSecure can discover sensitive personal data in structured, semi-structured, and unstructured formats, and delivers comprehensive, visual reports and dashboards showing you precisely what sensitive data you have, where it is located, and whether or not it is being masked or encrypted. 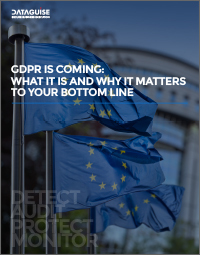 With this complete audit of your data, you can determine what next steps are needed for General Data Protection Regulation (GDPR) compliance. Only sensitive data that is germane to the business need for which data processing occurs is allowed to be part of that processing. Masked or encrypted data., however, may not necessarily be considered sensitive. Furthermore, data subjects’ rights to their data may not apply if the data cannot be easily attributable to them. Dataguise DgSecure allows extensive business applications of data without dramatically raising your enterprise’s data handling liability with regards to General Data Protection Regulation (GDPR) compliance. General Data Protection Regulation (GDPR) compliance isn’t a one-time or even once-a-year requirement. Your enterprise will need to maintain a constant state of compliance—no small feat, as big data gets bigger, cloud usage grows, and more users access more data for greater business insights. Sensitive data will be flowing continually into and out of your enterprise. Dataguise DgSecure can help you detect, protect, and monitor sensitive data in real-time, continuous processes, while providing your executives one consolidated view of compliance and risk positions at any given time. 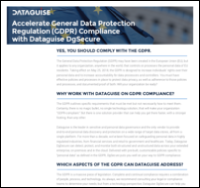 For more information about how Dataguise can help you with General Data Protection Regulation (GDPR) compliance, please contact us.